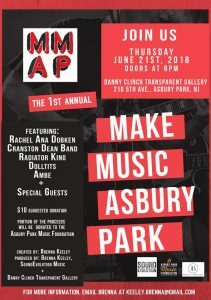 The 1st Annual Make Music Asbury Park event debuts on Thursday June 21st at 6pm, at the Danny Clinch Transparent Gallery. Kick off the official start of summer with live music while celebrating the Summer Solstice. Make Music New York has hosts over 1,000 concerts on this date and given our music culture, Asbury Park is a logical extension of this celebration. Created by Brenna Keeley, Make Music Asbury Park will feature artists from New York based record label SoundEvolution along with local acts. Come see Rachel Ana Dobken, Cranston Dean Band, Radiator King, Dolltits, and Ambe and other special guests. There is a suggested $10 donation, of which a portion will go to the Asbury Park Music Foundation to support our youth music education programs. Enjoy the works of many talented musicians on this longest day of the year. A large turnout is expected, so be sure to RSVP by emailing keely.brenna@gmail.com. More details can be found on the Make Music Asbury Park Facebook page as well. Here’s to a fantastic inauguration of Make Music Asbury Park!